Reel type push mowers are becoming very popular, again. They use no gasoline, do not pollute the air, provide a much better cut than power mowers and one benefits from a healthy physical work-out. They are best suited for the small yard while gasoline powered reels are practical for bigger areas of grass. Here at HDR Small Engine Repair, we clean adjust and put a new edge on your reel mower. Some words of caution. 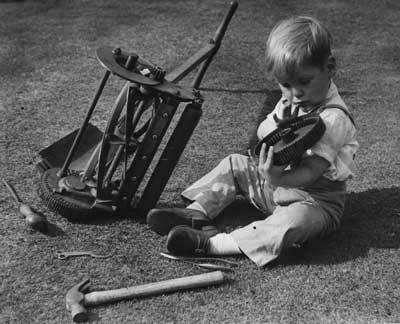 If you attempt to sharpen a reel mower freehand using a file or a grinding wheel on a drill gun you’re simply going to ruin your machine. 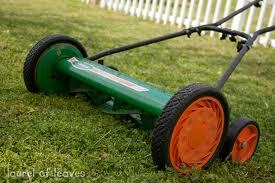 Reel mowers are fragile — that is to say that dropping or jarring them can put the bed blade out of adjustment. Also, binding sticks, small stones, and other similar debris between the reels and bed blade will bend the bed blade on some models. It’s a good idea to check and clean your yard before you mow. Of course, in most cases, we can make the necessary repairs to put your machine back into like new working order. You’ll notice a set of two adjusting screws on each side of the bed blade. If you make an adjustment to them, be sure that the reel rotates freely, just barely touching the bed blade. You should hear a crisp “whooosh” sound as the reel turns. Walk-behind Reel Lawn Mower Sharpen $37.50 + pick up & delivery, parts and tax that are not listed below in this package!